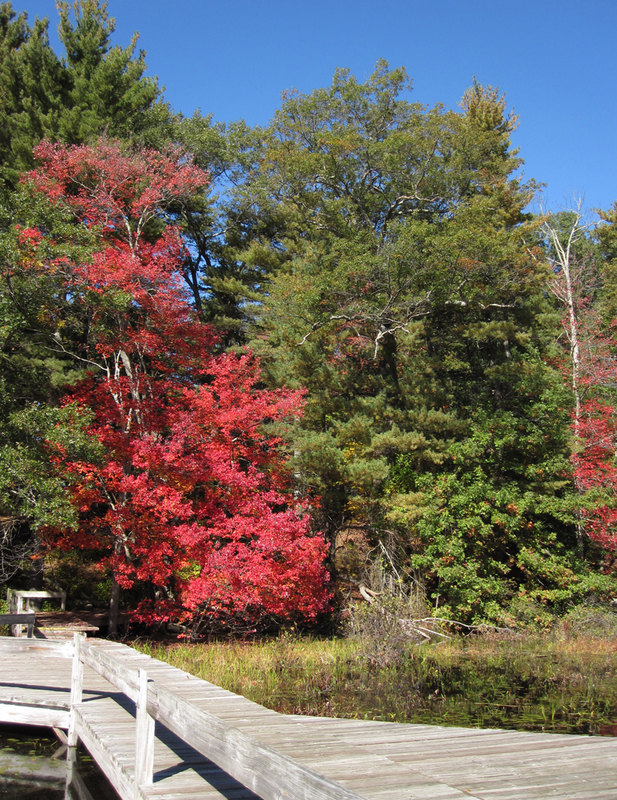 Posted on November 30, 2015 by Barry V.
Autumn is coming on strong and touches of fall color are everywhere on this large reserve in Natick. The shortening of the days is ushering in the fall migrants: white-throated and swamp sparrows, ruby-crowned kinglets, palm and yellow-rumped warblers. Yellow-rumps are everywhere today, announcing their presence with soft “check” notes. I watch them forage high and low in oaks, maples, birches, cedars, and even poking around in the cattails near the All-persons Trail. Along the boardwalk, I meet Director Elissa Landre and she suggests the Old Orchard Trail as a good place for my artistic explorations. And, it proves to be a good tip. The open fields here are not only scenic, but attractive to a variety of birds. 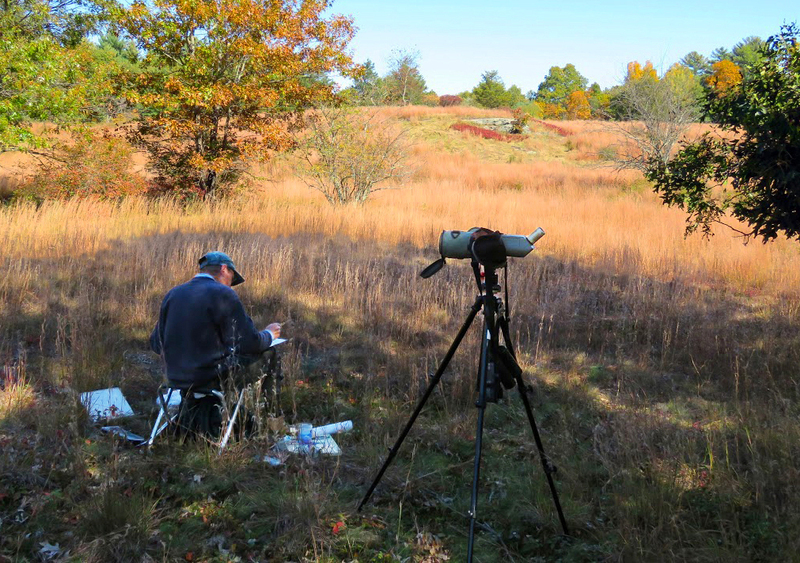 I set up my painting kit as overhead a Cooper’s hawk makes lazy circles in a deep blue sky before peeling off to the South. 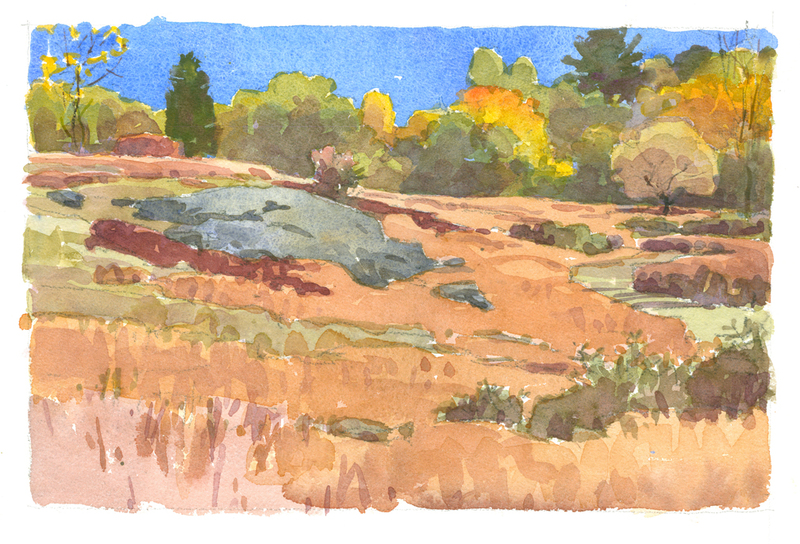 A nearly unbroken swath of little bluestem grass carpets the gentle knoll of the Old Orchard, suffusing the landscape with a strange orange-pink hue. A rounded rock outcrop emerges from the grass, and scattered pines and cedars lend some dark accents. A few bright maples flare with crimson amid the softer greens of the field edge. The sky is so blue you could reach out and touch it. The scene is begging to be painted, so I get to work. 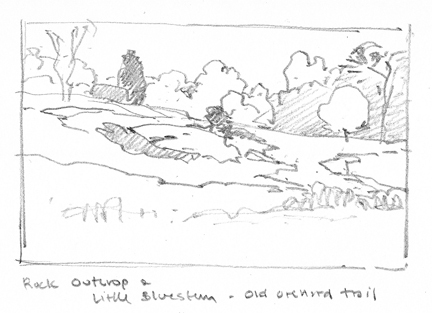 Before starting on my sheet of watercolor paper, I do a simple pencil drawing in my sketchbook. This helps me figure out how to “crop” the landscape spread out before me, and to organize the elements into a satisfying composition. I almost always make changes to a scene that I’m painting – who says you can’t improve on Nature? Once I get into the painting, I don’t hold back on the colors. I make the sky extra blue and the little bluestem a strong orange-pink. However, I’m also careful to provide neutral colors where the eye gets a rest – the muted greens of the tree line, and the cool grays of the boulder out-crop. As luck would have it, Elissa comes by with Nils Navarro and Lisa Sorenson, and Lisa offers to take some photos of me at work. Thanks, Lisa! 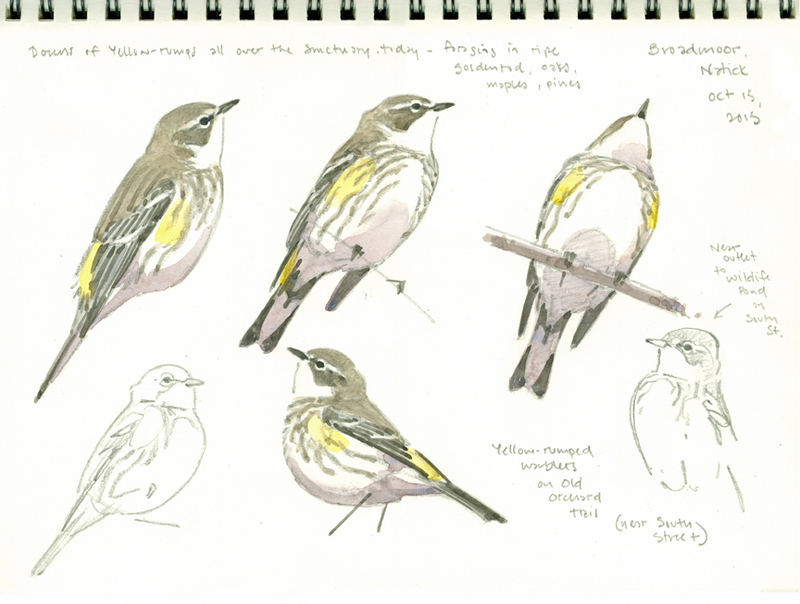 This entry was posted in Artists, Barry Van Dusen Residency, Education, News and tagged Barry Van Dusen, Birds, Broadmoor wildlife landscape, Broadmoor wildlife sanctuary, Landscape, Museum of American Bird Art, Natick, Natural History, Sketching, Watercolors, Wildlife Sanctuary, yellow-rumped warbler on November 30, 2015 by Barry V..